This work was created for the exhibition Pour un couteau at Le Creux de l’Enfer, Le Centre d’art contemporain, Thiers, France, February 11 – April 16, 1995. The curator invited artists to develop a work that related in some way to the “knife.” (Knife-making had been part of the history of Thiers since the fourteenth century.) 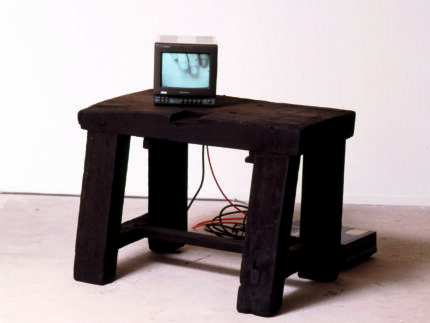 It utilizes an edited segment of one source used in Suspension of Disbelief (for Marine), 1991-92. Instead of the images rapidly switching among several monitors constructing extended views of the body, the viewer sees the “raw” linear cuts (all 2 frames in length) multiplexed together as a linear stream of images on a single monitor. This work was created for the exhibition Pour un couteau at Le Creux de l’Enfer, Le Centre d’art contemporain, Thiers, France, February 11 – April 16, 1995.